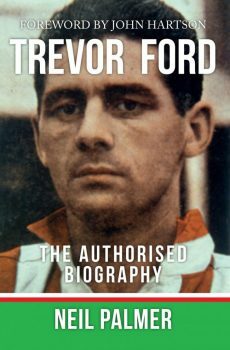 Wales forward Trevor Ford became a poster boy of 1950s football before startling revelations to a newspaper turned the public against him. Ford upset a gigantic applecart when he revealed in the Sunday Express that clubs regularly made illegal payments to players. In drab, post-war Britain, the entertainment-starved population flocked to see footballers like Ford battle for the League title. Top clubs regularly attracted 60,000 attendances while more than 40,000 swarmed through turnstiles to watch Ford’s Cardiff City. This interest generated barrowloads of cash for clubs, while the players were restricted to £20 a week by the maximum wage regulation. Ford’s 1957 book I Lead the Attack, written by former Empire News and Sunday Chronicle journalist Howard Green, disclosed for the first time how some clubs got around this restriction. When pre-publication serialisation began in the Sunday Express, the football authorities had to act. In order to lure top players, Ford revealed some clubs apparently offered additional jobs, especially in the summer when wages could drop as low as £12 a week. Ford himself had a part-time garage job. While at Sunderland a director challenged Ford to a game of snooker and suggested they play for £100. Ford reluctantly agreed to put five weeks wages at risk and was relieved when he saw the director playing so badly. When he collected the £100, Ford agreed with the director’s suggestion for a re-match the following week. So it went on, with Ford’s moderate game still far too good for the director. Other schemes revealed by Ford included houses provided for players rent-free or at a token cost, and new appliances like refrigerators or cookers installed free. Stories like this had circulated in football for some time, but Ford’s book was the first time they had been confirmed. Cardiff suspended Ford and he was summoned to appear before an FA committee, who banned him indefinitely. So much for whistleblowers. The ban was overturned on appeal when Ford pointed out he had not named names in the book nor been charged with any offence and therefore had prepared no defence. Instead, fines were handed out to several clubs instead. 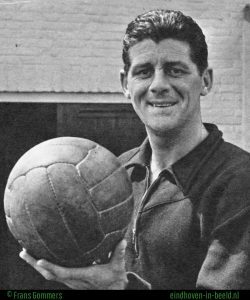 Ford fell out of love with British football, moving to PSV Eindhoven where he scored regularly in a blossoming Dutch league. An established Welsh international, he looked forward eagerly to the 1958 World Cup finals in Sweden. But the stigma of the bung revelations clung on, no selector bothered watching him in Holland and he was left out of the squad. This decision came back to haunt Wales when John Charles got injured and they realised they had no centre forward cover for the quarter final with Brazil, which they lost. Ford, born in Swansea in 1923, was a popular child in the town where his cinema manager father allowed him to sneak friends in free. Leaving school at 15, Ford got a job at the local steelworks before being spotted playing local league football and offered an Arsenal trial. Ford’s rebellious streak kicked in as he turned Arsenal down saying he was too young to leave home. So he kicked off a glittering career at Swansea. After only 16 matches there he picked Aston Villa from a queue of clubs jostling for his signature and hit 60 goals in 120 matches for the claret and blues. But after three seasons he was ready for the move that really blasted him into the big time. Trevor Ford, the ex-steelworker from a humble back to back in Townhill with an outside loo, became Britain’s most expensive footballer as Sunderland paid £30,000 for his scoring talents. The ups and downs of Trevor Ford’s life story make a gripping tale. Freelance writer Neil Palmer’s eighth book is full of twists and turns in a football CV which ends at Romford, where I managed to see Ford in a Southern League match in the early 1960s. He must have been around 40, and he didn’t run too much. But he still had an aura about him and commanded respect from teammates and opponents. Ford was among the fiercest and best of the battering ram centre forwards prized at most top clubs in the 1950s who in a different era might have been a multi-millionaire. Some idea of his fame is conveyed in the book. Long after retirement, Ford attended a function featuring a whole host of star footballers and soon queues of autograph hunters formed at each table. One of the longest was for Ford’s signature. Standing in the queue were Denis Law and George Best. Neil Palmer has done such a fine job of capturing the football atmosphere of the 1950s that you can almost smell the dubbin and the liniment.